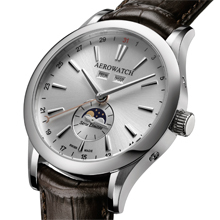 For over 100 years, AEROWATCH has safeguarded an enviable global reputation as a maker of extraordinary timepieces. AEROWATCH continues this remarkable heritage with the limited edition launch of the "Les Grandes Classiques Venus 203" collection. 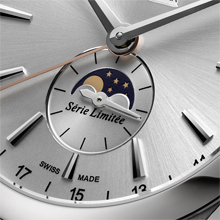 The new line exemplifies the company's corporate culture, which stands for top-flight creations and timeless elegance. The new "Les Grandes Classiques Venus 203" portfolio showcases a watch with a graceful balance between technical finesse and aesthetic appeal. With a diameter of 41 mm, the exceptional timepiece embodies all the attributes of true watchmaking artistry, perfectly uniting functionality and design. The subtly textured dial epitomizes the sleek and uncluttered styling of the watch in a mystical way, highlighting its baton hour markers and hands. Clarity reigns with the moon-phase indication at 6 o'clock as well as the day and month displays just beneath the maker's mark in the top half of the dial. The polished, screwed case underscores the noble lineage of this fine timekeeping instrument. Jean-Sébastien Bolzli, who is responsible for marketing and sales, says: "For the first time in our company's history, we have the opportunity to proudly present a watch with a Venus 203 caliber. Our objective was to debut a timepiece that harmoniously combines traditional watchmaking prowess with contemporary panache, reflecting the creativity at the core of our company's passion. We are very satisfied with the result. And the fact that the price/performance ratio is right corresponds to our company philosophy."